At Jet Center at Santa Fe, you will experience our legacy of award winning customer service delivered by our friendly, highly experienced and professional staff. Our entire company is committed to be the very best, always making your travel experience exceptional. So, it's no surprise that we continue to receive the highest accolades from our clients. 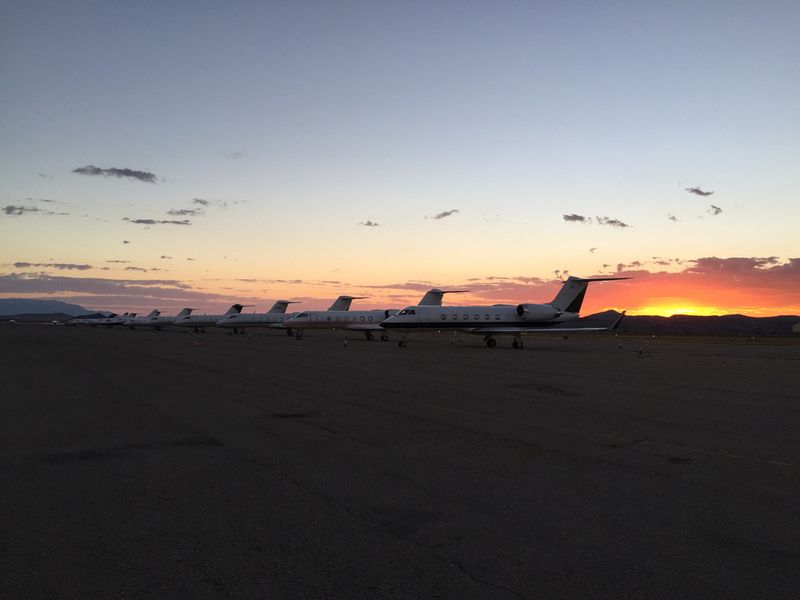 Jet Center at Santa Fe is founded by Santa Fe aviation veterans and offers a full line of aviation support services, 10+ acres of ramp/tie down, concierge, pilot lounge, FBO amenities, new heated hangar and 145 Repair Station CRS# PUVR537X. We look forward to serving you soon! Call us today at 505-780-4455 to begin your personal VIP treatment at Jet Center at Santa Fe. We know that our people are our most powerful fuel and if your every experience at Jet Center at Santa Fe does not leave you feeling valued and appreciated, then our job isn’t done. Our highly trained flight coordinator and line service technicians assure that you always receive a seamless and exceptional private travel experience delivered with a smile! We are located just north of the control tower at the intersection of taxiway Golf and Alpha in our newly remodeled ramp-side terminal. PLEASE ASK THE TOWER FOR PROGRESSIVE TAXI INSTRUCTIONS TO JET CENTER. Amenities include a passenger waiting area, private pilot lounge, briefing rooms, Wi-Fi, heated hangar and plane-side car service. We offer a full service Part 145 repair station and avionics shop operated by Santa Fe Aero Services. Careers. Requests. Reservations. Additional Information. TETERBORO, N.J. / August 10, 2016 – Jet Aviation has signed a Fixed Base Operation (FBO) alliance with Jet Center at Santa Fe to offer customers with more choices. Jet Aviation, with more than 20 FBO operations worldwide, and Jet Center at Santa Fe recently signed an FBO alliance agreement. This partnership offers customers additional locations from which to choose, with guaranteed levels of service. The companies will also share best practices and combine resources. Jet Center at Santa Fe is a full-service FBO founded by a team of industry veterans who proudly bring more than 75 years of aviation experience to KSAF. Jet Center at Santa Fe has a passionate and highly experienced professional staff committed to make every experience exceptional and is very proud to bring our legacy of award winning service back to the Santa Fe community. The company provides FBO and fuel services along with a Part 145 repair station. Please visit www.jetcentersf.com for more information. Jet Aviation, a wholly owned subsidiary of General Dynamics (NYSE: GD), was founded in Switzerland in 1967 and is one of the leading business aviation services companies in the world. Close to 4,500 employees cater to client needs from more than 25 airport facilities throughout Europe, the Middle East, Asia and North and South America. The company provides maintenance, completions and refurbishment, engineering, FBO and fuel services, along with aircraft management, charter services, aircraft sales and personnel services. Jet Aviation's European and U.S. aircraft management and charter divisions jointly operate a fleet of almost 300 aircraft. Please visit www.jetaviation.com and follow us on twitter: http://twitter.com/jetaviation. Let our excellent concierge and customer service staff help you with your next visit. We have personally selected the hotels and restaurants below as some of our favorite spots, and we are more than happy to make additional recommendations based on your preferences. Just let us know what you are looking for, and we'll handle every detail. Allow us to make your reservation and you will enjoy the Jet Center discount and free breakfast at select locations. In order to better serve you, please let us know you are coming and what services you require. We will promptly confirm your reservation. To speak to a customer service representative, please call 505-780-4455.